Farmers in Kangra, who have diversified to growing exotic vegetables, are incurring losses. Lack of adequate guidance, planning and infrastructure are citied to be the basic reasons behind it.The state was taking pride in the fact that coloured capsicum was finding its market in five-star hotels of north India. Justice Altamas Kabir, Supreme Court Judge and Executive Chairman, National Legal Service Authority, today stressed the need for adopting “mediation” as an alternate dispute redressal mechanism to avoid delays, loss of time and money. 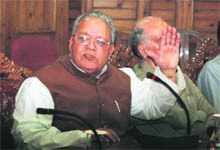 National BJP vice-president and senior leader from Uttar Pradesh, Kalraj Mishra, today said the UPA regime was indulging in ‘Muslim appeasement’ for its vote bank politics at the cost of national unity and integrity. Road upgradation projects started by the National Highway Authority of India (NHAI) are proving to be a big drain on the scarce resources of the government. Despite the fact that most of the road fatalities are reported from stretches between Aut and Mandi and Kangu-Sundernagar-Mandi on the National Highway 21, both the National Highway Authorities of India (NHAI) and the State Health and Family Welfare Department are yet to do something about trauma services in the region. The second oldest forensic laboratory in the world, the Government Examiner of Questioned Documents (GEQD), here, has lost its identity with its merger in the Central Forensic Science Laboratory (CFSL), Chandigarh. The Nature Watch India (NWI) has urged the government to put an appropriate mechanism in place for effective watch on transportation of cattle for sale and dumping of abandoned animals. Commuters in the state capital as well as other parts of the district today faced a lot of inconvenience on account of the strike by private bus operators in protest against the bad condition of roads. The Himachal Apple Growers’ Association on Thursday sought the government intervention on the issue of charging of commission from apple growers in the Delhi Fruit Market. Kangra Central Cooperative Bank will soon be online and open its branches in other parts of the country. This was stated by its chairman Rasil Singh Mankotia, addressing mediapersons in a press conference at the zonal office of the bank on Thursday. A letter by post, which should not have taken more than three days to reach Talai in this district from Dalhousie, actually took 15 days to reach its destination. The delay cost a candidate dear who lost the golden chance of selection for the post for which he waiting anxiously. The Technical Assistant (Takniki Sahayak) Association today called off their strike after Rural Development and Panchayati Raj Minister Jai Ram Thakur assured that their demands and grievances would be considered sympathetically. Resentment prevails among interns of Tanda Medical College over the government’s apathy towards them as they alleged that they were given the lowest stipend in the country despite heavy work load. In its pursuit to supply pure and mud-free clean potable water through its schemes, Irrigation and Public Health (IPH) Department is making serious efforts to install equipment in the state to improve the purity level of drinking water being supplied to public. The HP High Court yesterday directed the state Chief Secretary to make a concrete plan to set up the effluent treatment plant (ETP) at Baddi-Barotiwala-Nalagarh, the industrial hub of the state. The HP State Consumer Disputes Redressal Commission has directed Oriental Insurance Company to pay Rs 4,20,750 as claim to complainant Mubark Singh of Mandi. The District Green House Owners’ Association here has strongly criticised the government’s dual policy regarding provision of subsidy for setting up of green houses in the state. It has demanded that the government should re-consider problems of new and modern technique of growing sophisticated flowers and vegetables in the interests of farmers. A memorandum of understanding (MoU) was signed between the state government and the Jaypee Group for setting up a 2.75 million tonne capacity clinker unit at Baga village in Solan and 1.5 million tonne capacity cement grinding unit at Malokhar in Bilaspur with the investment of Rs 610 crore. The two units will generate employment for more than 600 people. Fish production in the state has raised eyebrows. The Fisheries Department introduces over 70 lakh fingerlings in the main fishing ponds — Bhakhra in Bilaspur and Pong dam in Kangra — on an average every year. However, it produces not more than 1,515 tonnes fish as against the expected production of 12,000 tonnes if one goes by the department’s survival rate of 90 per cent. The famous Shravan Ashtami Navratra fair at the popular shrine of Naina Devi concluded yesterday with organisation of a “hawan yajna” by devotees. Last year, farmers who had diversified to growing coloured capsicum had fetched price ranging from Rs 100 to Rs 150 per kg. With many more farmers joining the bandwagon, the market price fell last year and farmers had to incur heavy losses. When contacted, a few farmers who had been growing exotic vegetables successfully, said coloured capsicum had market in just high-end hotels and its demand was limited. It was also found that many farmers burnt their fingers trying to grow broccoli, another exotic vegetable, and cut flowers in Kangra district. Both the crops fetch good price during off-season. In case of broccoli, its price varies between Rs 600 per kg to Rs 10 per kg, depending on demand. Farmers in the state who went for cultivation of the said crops without any guidance had to suffer losses, said Shiv Paul Singh, a farmer who has been growing exotic vegetables and flowers for more than a decade now. According to him, till the state government raises infrastructure for exotic crops at par with that of apple, experimentation would only lead to loss for farmers. The state government has to create cells at block or at least tehsil-level to guide farmers regarding market conditions for growing exotic crops. Experts should be hired by the state government to guide farmers in the matter, he added. Infrastructure for transporting exotic crops to markets where they can fetch maximum price is another challenging task as most of the poor farmers cannot afford to do so. Meanwhile, progressive farmers are apprehensive about the recent endeavour of the Kangra district administration to promote floriculture. They alleged that a similar kind of project was started by the state government in Kangra in 2000. A Mumbai-based company had duped farmers then. A few of them are still reeling under the loans they had taken at the assurance that the company would buy their produce. He was speaking at the one-day workshop on Mediation and Training for Referral Judges and Mediators organised by the HP State Legal Service Authority and Mediation Committee of the HP High Court, here today. Justice Kabir said mediation was a voluntary negotiation where a third party assisted the litigating parties to amicably resolve disputes through proper communication and negotiation techniques. “Negotiation parties in mediation proceedings are free to agree for an amicable settlement even ignoring their legal entitlement or liabilities,” he explained. He said mediation saved precious time, energy and money of parties. “It has been seen that mediation often works well in resolving prolonged litigation pending in courts for several years,” he said. Mediation centres had been set up in all high courts to help litigants for early redressal of disputes, he added. Justice RB Raveendran, chairman, Supreme Court Legal Services Committee, said Section 89 had not been implemented in the manner it should have been. “Alternative methods of justice have to be evolved even though Lok Adalats had also helped in solving long-pending cases,” he said. He added that mediation centres had helped litigants improve relationship, both personal or commercial, and also reduced unnecessary tension, harassment and litigation cost. Himachal High Court Chief Justice Kurian Joseph said at present 45,000 cases were pending in the high court whereas the pendency in the 106 subordinate courts had touched 1.57 lakh. “Efforts are being made to popularise the mediation system by educating people right upto grassroots level for which trained mediators are being involved,” he said. Justice RB Misra, HP High Court Judge and chairman, HP Legal Services Authority, said Legal Services Authority intended to create awareness about the procedure of mediation as it helped in bringing about quick, responsive and economic redressal of disputes. He, however, added that in order to bring about negotiation, the mediator should be humble, polite, vigilant and unbiased. Minister of Social Justice and Empowerment Sarveen Chaudhari, Advocate General RK Bawa and Bar Council chairman Naresh Sud also spoke on the occasion. Mishra, a Rajya Sabha MP who has been made in charge of BJP affairs in Himachal, arrived here today to hold talks with senior party leaders. “All political parties indulge in vote bank politics but certainly not the BJP, especially when the unity and integrity of the nation is concerned,” he said. Mishra said such policy of appeasement of the minorities by the UPA regime would only embolden the separatist forces like Naxals, Maoists and the ISI which was fast spreading its tentacles in India. “The BJP is opposed to any such forces, be it Hindu or Muslim who are traitors and a threat to the unity and integrity of the country,” he clarified. The BJP leader said his party has assured the UPA regime of full cooperation on all issues concerning national interest but the government had failed to take effective steps to check separatist forces. “What is even more strange is the fact UPA ministers have been giving conflicting statements and now even the Prime Minister has gone to the extent of saying that there should be a debate on the question of autonomy in Jammu and Kashmir,” he said. In reply to a query he said the abolition of Article 370 in Jammu and Kashmir and construction of the Ram Temple at Ayodhya were very much on the agenda of the BJP. He said the BJP regime in Himachal had been performing well and all basic facilities like water, electricity, schools and health centres had been provided in all the villages. An internal document of the Planning Commission, obtained under the Right to Information (RTI) by Dev Ashish Bhattacharya, an RTI activist, reveals that the NHAI is wasting public funds by building over-capacity roads. The report “sub-prime highways” by Gajendra Haldia, infrastructure adviser to Deputy Chairman of the commission, contains several such instances. The samples included in the report reveal that in two sectors covering 280 km length of National Highways-14 and 76 alone, Rs 1,770 crore has been squandered away. The first case pertains to four-laning of the 120 km Swaroop Ganj-Udaipur section in Rajasthan on which Rs 1,070 crore was spent. The volume of traffic was only 2,034 passenger car units (PCU), equivalent to 1,020 vehicles per day, whereas a four-lane is built only for traffic of 40,000 PCU and more. Similarly, the four-laning of 160.5 km of the Chittorgarh-Kota section costing Rs 1,260 crore, including 43 km of service lane, a rail overbridge and a flyover, was not required as traffic on the road was only 4348 pcu (2150 vehicles). A two-lane road would have been sufficed for over 30 years. The NHAI will argue that it was a Cabinet decision. Moreover, it has not implemented a three-year old Cabinet decision for six-laning of the Golden Quadrilateral on the plea that traffic on some of its sections was inadequate (75 per cent) but it builds four-lane highways where the traffic is not even 25 per cent of the capacity of a two-lane carriageway. Most of the casualty cases are referred to Mandi Zonal Hospital. However, all proposals to start the trauma services at the zonal hospital here are only on papers. According to a survey, in every 100 accidents on roads in Himachal, as many as 30 persons are killed and another 150 are injured. They, in turn, suffer deformities in many cases. In 1999, as many as 693 persons were killed and over 3,400 passengers injured in 2,043 road accidents in the state, most of them in central region. The fatalities rose to 848 injuring 4,200 others in 2,756 road mishaps in 2008. Also, more than 60 per cent of victims die after vehicles roll down into gorges, observed the study. However, trauma services remain inadequate and violations like overloading and misuse of vehicle for transporting people, bad roads, fitness of drivers and vehicles remain unchecked, according to experts. On the other hand, only the IGMC, Shimla, have neurosurgery facilities for accident victims. The Mandi zonal hospital had proposed a dedicated casualty staff of doctors and nurses, a minor operation theatre, portable X-ray, ECG and other facilities to meet the need of emergency patients. The Leda truck mishap that killed 39 persons and injured 36 others on August 18 brought to fore the poor casualty services at the hospital. Eight patients were referred to the PGI, Chandigarh, or the IGMC as the hospital had no permanent surgeon, leave alone a neurosurgeon. Even the trauma services proposed at Kullu regional hospital and Bilaspur district hospital on the NH-21 are yet to see the light of the day even after four years. Dr Pathak said the department would strengthen the casualty services at Mandi hospital and a surgeon would join them soon. There have been several moves in the past to shift the institution set up by the Britishers in 1904 primarily to censor letters and identification of handwritings on subversive literature to nail the freedom fighters because of its historical importance. Many modern forensic laboratories were set up across the country but the GQED was retained as an independent entity keeping in view its significance in the development of forensic science in the country. In fact, successive chief ministers had taken up the issue with the Centre to ensure that the institutions remained in Shimla. However, according to the latest orders passed by the Ministry of Home Affairs, the laboratory has been merged and put under the administrative control of the CFSL, Chandigarh. Regarded as one of the best in the field of forensics, it was virtually the mother institution because of the significant contribution towards the training of experts for almost all central and state forensic laboratories. It played a key role in solving many important cases, including the hawala case, multi-crore securities scam, the case of alleged bribes paid to Jharkahnd Mukti Morcha MPs and forgery of the signatures of Prime Minister. The development was unexpected as the Union Home Minister has, while addressing the All-India Forensic Science Conference held at Jaipur last year, announced that three more GEQDs would be set up in the country. The merger of the institution will mark the end of the road as far as future scope for development is concerned. There is also a lurking fear that it may be eventually shifted to Chandigarh. Appreciating the amendment to the Prohibitionof Cow Slaughter Act to regulate transportation of cattle, convener of the NWI Rajeshwar Negisaid the step would go a long way in checkingthe dumping of abandoned cattle. He said there was need to take measures for effective implementation of the law and suggested the creation of designated police check posts at the state borders and setting up of flying squads to keep a watch on vehicles transporting animals. The government should also set up go-sadans and animal shelters in both urban and rural areas for abandoned, injured and diseased animals and also impose sever penalty on those indulging in cruelty to animals. A sustained campaign should be launched tocreate awareness among the people about importance of animals andneed to maintain ecological balance and take steps to reduce animal-human conflict. There was an urgent need to effectively tackle the stray cattle menace and wild animal nuisance and this could be done by giving priority to dairy farming and preventing deforestation. 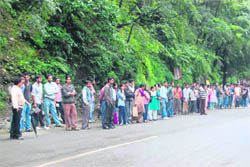 Even though the Himachal Road Transport Corporation (HRTC) had made alternate arrangements to avoid any inconvenience to the public but with private buses outnumbering government vehicles, people faced a lot of problem. Office-goers and school children were hit as the private buses remained off the road not just in the state capital but also in other parts of the district. However, the only respite being that there were practically no traffic jams in the town on account of over 300 private buses remaining off the road. The private bus operators had decided to observe strike today to draw the attention of the government towards the deplorable road conditions, which in many cases was responsible for fatal accidents. They said it had been noticed that in most of the mishaps that took place during the past few days, the bad road condition was mainly responsible for the accident. The private bus operators demanded that the government must initiate steps to improve road conditions after the monsoons.They said even though the monsoons this year had been very severe but the substandard work undertaken in the road construction was the main reason for the poor condition of roads. It said the growers were facing lots of problems in transporting their produce on account of bad roads, shortage of trucks and exorbitant freight. In a statement issued here today, Ravinder Chauhan, president of the association, said despite the government’s assurance to growers about arrangements for apple transportation, there was an acute shortage of trucks. “In the absence of truck availability from the control rooms, we have no option but to hire trucks on higher freights than fixed by the administration,” he said. Chauhan said the condition of the roads was so deplorable that operators were reluctant to send their trucks to the apple belt. “There is a shortage of packaging material for which the growers are being overcharged and if this is not solved, there will be major crisis when the apple season is in full swing,” he said. He urged the government to direct the PWD authorities to maintain the roads. “With problem in transportation due to bad roads, there is delay in sending the fruit to the markets, resulting in decay of the fruit during transportation,” he said. Congress leader Devender Bushairi also lashed out at the failure of the government in ensuring smooth transportation of apple. “There is no justification in the government’s explanation that it is on account of monsoon that problem is being faced as apple season is always at this time of the year,” he said. He said the bank had been given licence by the RBI recently though the bank had been working for the past 90 years. The bank would instal ATMs, initially at all subdivisional levels and later in other towns. He said the bank had signed MoU with HDFC Bank, ICICI Bank and Axis Bank for issuing demand drafts on their stationery to facilitate its customers so that the cheques were accepted in all cities of India. The bank had also signed agreements with the National Insurance and Kodak Mahindra for insurance business. He further revealed that the board of the bank had offered bilateral business offer to the management of the state cooperative bank for opening branches in each other’s area of operation. Talking about the shortage of staff and new appointments in the bank, Mankotia agreed that the staff shortage by more than 500 employees was there but the bank had constraints for inviting applications for new recruitment due to the SC orders. Noteworthy, a bus journey between these two destinations does not take more than 12 hours. According to reports, the letter addressed to an unemployed youth Kewal Krishan, son of Amar Singh Kapoor of Talai, was posted from Station Headquarters, Dalhousie Cantonment, on July 31 for interview of post of switch board operator. However, it reached the addressee on August 14 while he was summoned for the interview at 9 am on August 11. The father of the youth has demanded a high-level inquiry into this serious lapse by the postal department and exemplary punishment so that such a thing is not repeated in future. Representatives of the association met the minister here last evening and put forth their demands, mainly concerning with terms and conditions of their appointments. They demanded that the present rules of appointment of Takniki Sahayaks should be changed as there were lot of technical hindrances. After receiving the assurance from the minister, most of the Takniki Sahayaks resumed their duties today. Concerned over complaints of supply of muddy drinking water through the taps of the department, the department has sought the help of water purifier companies for inviting modern techniques of water purifying and supply equipment for this purpose. To supply clean and pollution-free drinking water is quite a problem as the mud level in various drinking water supply schemes of the department increases to a great extent during rainy season or even during other times followed by the rain. Since most of the drinking water schemes are based on major rivers of the state, the water drawn for supply of potable water contains huge silt, requiring great effort to remove the silt and purify the water. Supplying clean and pollution-free water becomes a serious problem for the IPH Department after the rains as mud level in water supply is also quite high since despite chlorination and filtration the water supplied remains muddy. Even addition of alum in the drinking water helps to only some extent in removing mud content from the water but its colour still remains muddy. To make the chlorination process more scientific the department has already started gas chlorination process instead of using traditional method of adding bleaching powder in storage tanks. A meeting of Principal Secretaries of industries, urban development, irrigation and public health, town and country planning, forest department and member secretary of the state pollution control board has been convened in this regard on or before September 8. Taking serious note of environment degradation in the industrial belt, Justice Deepak Gupta and Justice Sanjay Karol said the meeting would consider how many common effluent treatment plants were required to be set up. It was informed to the court that the Union Ministry of Commerce had already agreed to pay Rs 70 crore for setting up of this plant. Therefore, there could not be any shortage of fund to at least start the construction work at the earliest. If further funds were required, the state could make suitable arrangement, they added. The court further stated that the committee would also consider setting up of a municipal solid waste management plant to deal with waste generated in the area by Baddi-Barotiwala and Nalagarh Development Authority. To check defaulters, the court directed the Pollution Control Board to take random samples of effluents from at least 50 industries within 45 days from yesterday and place the same before the court. The next hearing in the matter is scheduled for September 10. The commission, headed by Justice Arun Kumar Goel (retd), passed this order on an appeal filed by the complainant against the order of the Mandi Consumer Forum vide which it had dismissed the complaint. According to the complainant, his vehicle was insured with the company for Rs 7,13,000. However, it met with an accident on May 28, 2008. After receipt of intimation regarding the accident, the insurance company appointed a surveyor. The claim of the appellant was repudiated by the company on the ground that the vehicle involved in the accident was a medium commercial vehicle, whereas the driver who was at the wheel at the time of the accident, was licensed to drive a Light Transport Vehicle (LTV). Both these pleas were seriously contested and resisted by the company. A meeting was held here today in this regard which was presided over by Vinay Bhandari, a progressive farmer, and attended by about 60 others. Bhandari said earlier, these green houses were set up under the guidance, supervision and control of the Horticulture Department and they were given only 20 to 30 per cent subsidy by the government. However, now the government was giving subsidy from 80 to 90 per cent for the same green houses under the name of poly houses. Most of those who had set up green houses earlier have gone bankrupt due to several reasons, including little marketing experience, lack of fool-proof arrangements for proper marketing of their produce and exploitation by commission agents at various markets. They demanded that the policy of 80 to 90 per cent subsidy should be made applicable in their cases also to bail them out of their present financial crunch. The association has decided to meet Chief Minister PK Dhumal next week to seek his intervention in the matter. According to inputs gathered by The Tribune from fishermen and officials, fish production should have crossed 12,000 tonnes from 70 lakh fish seed introduced in the main fishing grounds in Bhakhra and Pong. The department claims that they introduce, on an average, over 35 lakh fingerlings each in Bhakhra and Pong dams and produces 1,515 tonnes fish worth Rs 8.42 crore last year. The survival rate is over 90 per cent and average fish size of the catch is more than 2 kg, the department claims. However, according to experts, the size of fish catch varies from 4 kg to 20 kg. “Even if it is believed that average size is 2 kg, 70 lakh fingerlings should produce more than 12,000 tonnes of fish each year at the survival rate of 90 per cent,” they add. The fisheries officials claim that fish production in Bhakhra has turned out to be 100 kg per hectare, which is one of the highest in the country. However, fishermen reveal that poaching is rampant as “fish catch” is unreported. BD Sharma, director, Fisheries Department, said they introduced fish seed close to one crore this year in Pong and Bhakhra dams in the presence of fishermen. “We have introduced 35 lakh fingerlings each in the Bhakhra and Pong dam this year and survival rate is 90 per cent,” he claimed. He added that fish production was satisfactory if they went by the national average. “However, poaching, silt problems and preying migratory birds eat up a major chunk of fish,” he added.